Afgelopen dagen 21 t/m 23 februari, was ik uitgenodigd op deze conferentie en zal hier beknopt de boodschap weergeven, wat Ayatollah Khamenei wilde zeggen en ook de vele delegatie leden van parlementsleden en NGO’s (Non -Governmental-Organizations). Hij en het Iraanse Parlement roept de Palestijnen op, zich te verenigen, hun onderlinge verschillen ter zijde te leggen, omdat dit het Zionistische regime in de kaart speelt en nog meer land kan innemen en de totale annexatie van Palestina uit kan roepen! Deze conferentie is de bevestiging van de 3e Intifada (opstand), die al een tijdje aan de gang is, maar tijdens deze dagen bevestigd is en een strijd zal worden voor de komende decennia. Bangalesh, Ierland, Nederland (www.stopdebezetting.org www.freesuriyah.eu www.palestine-prisoners.nl), Venezuela (5 delegatieleden van verschillende organisaties), Bangkok Times, anti-zionisten van de Joods orthodoxe geloofsgemeenschap (2 rabbi’s). Islam – Soennieten en Shia, Alawieten, Christelijke Orthodox en Katoliek, Ortodoxe Sefardische Joodse gemeenschap en onafhankelijke seculiere gemeenschappen. Hamas, Hezbollah, Fatah, PLO, Al-Kassam brigade, Al-Quds brigade, PLFP. Het gemeenschappelijke doel en uitkomst van de conferentie is het terugkrijgen van onrechtmatig verworven land door de Zionisten en kolonisten. Het recht op een Palestijnse staat, het recht op terugkeer van Palestijnen in de diaspora. De 3e intifada is hiermee uitgeroepen en kan en mag met alle middelen worden uitgevoerd, de tijde voor praten en een politiek oplossing zal altijd openstaan, maar alle pogingen zijn mislukt en dus het laatste middel wordt nu ingezet! From 21 until 23 February 2017, I have participated in the conference, as Chairman (NGO) of: www.stopdebezetting.org, for the Netherlands. Herunder, is the opening speech of the Grand leader Ayatollah Ali Khamenei. Reciting of Quran verses: 3:139, 47:35. The sorrowful story of Palestine and the excruciating sadness felt because, of the oppression against this patient, enduring and resistant nation, truly distresses any indivudual who seeks freedom, thruth and justice and it thrusts and agonizing pain and suffering upon one’s heart. The history of Palestine is full of ups and downs, marked by the cruel occupation of that region, the rendering of millions of individuals homeless and the courageous Resistance of those heroic people. An intelligent quest in history shows that no people in any era of history have ever been subject to such pain, suffering and cruelty. It has never witnessed that a country is completely occupied in a supra-regional plot, that a people driven away from their home and country and that another group of people from remote areas in the world are brought there in order to replace that nation. It has never witnessed that a real entity is ignored and that a fake entity takes it place. But this is another dirty page in history which will be closed with the permission and asssistance of Allah the Exalted, just like other dirty pages in history: “Falshood is bound to perish (Quran 17:81) and He says: “My servants the rigtheous shall inherit the earth” (Quran 21:105). Your conference is being held under one of the most diffucult circumstances in the world and in the region. These days, our region – which has always supported the people of Palestine in their fight against a global plot – is undergoing numerous upheavels and crises. The existing crises in several Islamic countries in the region have caused the support for the issue of Palestine and the holy ideal of Quds’ freedom to be undermined. Attention to the result of these crises helps us to understand which powers benefit from the existence of these crises. Those who created the Zionist regime in the region with the purpose hampering the stability, solidity and progress of the region through imposing a long-term conflict are behind the seditions that exist in the present time as well. These are seditions that have culminated in the capabillities of regional nations being used to foil one another because, of engagement in futile and meaningless conflicts. When all these capabillies are ruined, the ground will be prepared for strengthening the usurping Zionist regime on a daily basis. Amid all these, we are witness to the endeavors of well-intentioned and wise personalities in the Islamic Ummah. They are dilligently trying to resolve these differences. But unfortunatley, the complicated plots of the enemy have managed to impose civil wars on nations by benefeting from the negligence of some governments. These plots have managed to split nations against one another and to counter the effect of the endeavors that well-intentioned personalities in the Islamic Ummah have made. What is significant in this regard is the effort to weaken the position of the issue of Palestine and to give it the lowest priority. Despite, the differences that exist among Islamic countries – some of these differerences are natural, some originate from the enemy’s plot and the rest are because of negligence- the issue of Palestine can and should be the pivot of unity for all Islamic countries. 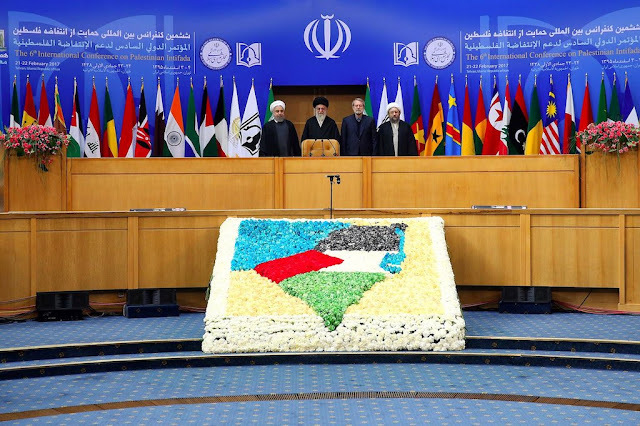 One of the achievements of this valuable conference is announcing the first priority of the world of Islam and freedom fighters all over the world, which is the issue of Palestine and the creation of an atmosphere of harmony and unanimity with the purpose of achieving the lofty goal of supporting the people of Palestine and their thruthful and justice-oriented fight. The significance of offering political support to the people of Palestine should never be neglected. This issue has a special priority in today’s world. Even if Muslim and freedom-fighter seeking nations have different viewpoints and opinions, they can gather together with one goal which is Palestine and the necessity to liberate it. With the emergence of signs of the collapse of the Zioninst regime and the weakness that has dominated its main-allies – in particular the United States of America – it is witnessed that the global environment is gradually moving towards confronting the hostile, illegal and inhuman activities of the Zionist regime. Of course, the global community and regional countries have not yet managed to carry out their responsibillities toward this humanitarian matter. Supressing the people of Paletine in a brutal manner, arresting numerous individuals, looting and murdering people, occupying the lands that belong to the Palestinian nation and building settlements in them, making an effort to change the appearance and identity of the Holy City of Quda, Masjid al-Aqsa and other holy Islamic and Christian places, violating the basic rights of citizens and many other abuses to exist. These acts enjoy the all-out support of the United States of America and some other western governments and unfortunately, they do not receive a proper response from the world. The people of Palestine are proud that Allah the Exalted has given them a great favor by helping them to shoulder the great responsibility of defending this Holy land and Masjid al-Aqsa. The people of Palestine have no option other than keeping the flames of fighting alight by relying on Allah the Exalted and by relying on their innate capabilities, as they have genuinely done so until today. The intifada has begun for the third time in the occupied lands, is subject to more suppression than the previous two, but it is still moving forward in a bright and hopeful manner. And by Allah’s permission, we will see that this intifada will begin a very important chapter in the history of fighting and that it will inflict another defeat on that uprising regime. From the beginning, this cancerous tumor has been devoloping in several phases until it turned into the current disaster. The cure for this tumor should be developed in phases as well. Until today, several intifadas and a constant and continious resistance have managed to achieve very important phase goals. The Palestinian intifada continues to gallop forward in a thunderous manner so that it can achieve its other goals until the complete liberation of Palestine. The great people of Palestine – on who’s shoulder lay the heavy burden of confronting global Zionism and its bullying supporters – have given an opportunity to all claimants to put their claims to the test and they have done so in a patient yet vigorous and solid manner. The day when “compromise proposals” were brought up seriously with the false excuse of realism and the necessity to accept minimum rights in order to prevent those rights from being violated, the people of Palestine and all those orientations which were already aware of the inaccuracy of that viewpoint gave it an opportunity. Of course, from the beginning, the Islamic Republic of Iran insisted on the incorrectness of compromise strategies and warned of their harmful effects and heavy damages. The opportunity that was given to the compromise procedure brought about destructive effects on the path of resistance and the fighting of the Palestinian nations, but the only benefit that it had was to prove the inaccuracy of the so-calles “realism” outlook in practice. Fundamentally the Zionist regime was formed in a way that it could not avoid seeking dominance, suppressing others and violating the true rights of the Palestinians. This is because, its entity and identity are dependent on the gradual destruction of the identity and entity of Palestine. The illegitimate entity of the Zionist regime will continue if it is founded on the ruins of Palestine’s identity and entity. That is why protecting Palestinian identity and guarding all the symbols of this thruthful and natural identity is a necessity and a holy jihad. As long as the name and memory of Palestine and the bright flames of the all-out resistance of that nation are preserved, it is not possible for the foundations of that usurping regime to be strengthened, The problem with “compromise” is not only that it legitimizes an usurping regime by violating the rights of a nation – of course, this is a grave and unforgivable mistake in itself – rather the problem is that it is completely at odds with the current condition of Palestine and that it does not take into account the expansionist oppressive and greedy characteristics f the Zionist. However, by grasping their opportunities, these people have managed to prove the inaccuracy of those who suppport compromise. As a result of this, a kind of national consensus has emerged about the correct methods for asserting the true rights of the Palestinian nation. Now, the people of Palestine have experienced two differerent paradigms in the past three decades of their history and they have understood the proportion of those two paradigms in relation to their conditions. The paradigm of heroic and continuous Resistance and holy intifada strands against the compromise paradigm. The first paradigm has brought about great achievements for that nation. It is not without reason that these days we witness that the resistance is being attacked and the intifada is being questioned by notorious centres. The enemy is not expected to act otherwise because, he is completely aware of the correctnes and fruitfulness of this path. However, we sometimes witness that some of those orientations and even countries which seemingly advocate the issue of Palestine but which are trying to divert the true path of those people in reality, attack the Resistance. Their claim is that in its decade-long life, the Resistance has not yet managed to help Palestine achieve its freedom and therefore, this method need to be reconsidered. In response, we say that although the Resistance has not yet managed to achieve its ultimate goal – the complete freedom of Palestine – it has managed to keep the issue of Palestine alive. We should ask in what condition we would be now if the Resistance did not exist. The most important achievement of the Resistance is creating a major barrier in the way of the Zionist projects. The Resistance’s success lies in imposing a war of attrition on the enemy. In other words, it has managed to defeat the main plan of the Zionist regime, namely dominating the whole region. In this process, the essence of the Resistance and the soldiers who engaged in resistance from the beginning against the establishment of the Zionist regime and who held up the flag of resistance and converted it to future generations by laying down their lives- should be praised and commemorated. The role of the Resistance in post-occupation eras is no secret to anyone and without a doubt, the victory of the Resistance in the 1973 war cannot be ignored although it was a narrow victory. Since, 1982, the burden of the Resistance fell practically on the people inside Palestine, but the Islamic Resistance of Lebanon – Hezbolah – turned to help the Palestinians in the path of their fight. If the Resistance had not brought the Zionis regime to its knees, we would now be witness its transgressions against other regional countries – from Egypt to Jordan, from Iraq, the Persian Gulf region to other areas. This achievement is very important, but is not the only achievement that the Resistance has made. The liberation of Southern Lebanon and Gaza is the attainment of two important phased goals in the process of Palestine’s liberation. This has helped reverse the process of the geographical expansion of the Zionist regime. Since the early 1980, not only has the Zionist regime not been able to transgress against new lands, but it has also begun to retreat. This retreat began with its humilating withdrawal from southern Lebanon and it continued with another humiliating withdrawal from Gaza. No one can deny the major determination role of the Resistance in the first intifada. In the second intifada as well, the role of the Resistance was fundamental and outstanding. This was an intifada which eventually forced the Zionist regime to leave Gaza. The 33-day war in Lebanon and 22-day, 8-day and 51-day wars in Gaza were all shining pages in the performance sheet of the Resistance. Those wars are a source of pride for all regional nations, for the world of Islam and for all freedom fighters in the world. This book (PALESTINE) presented at the conference, misused by Nethanyahu in his UN speech! The main hero during the Gaza wars is the courageous and resistant nation which continues to defend this fortress with realiance on the power of faith despite enduring many years of economic siege. It is necessary to commemorate all groups involved in the Palestinian Resistance- including Sarayah Al-Quda from Islamic Jihad, Khateb al-Izz ad-Din, Al-Qassam, from Hamas, Khateb al-Shuhada, al-Aqsa, from Fath and Khateb Abu Ali Mustafa, from the Popular Front for the Liberation of Palestine- all of which played valuable roles in these wars. The danger origination from the presence of the Zionist regime should never be ignored! Therefore, the Resistance should benefit from all the necessary tools for continuing its duty. On this path, all regional nations and governments and all freedom seekers in the world should meet the main needs of this resistant nation. The main pivot of the Restitance is the steadfastness and endurance of the Palestinian people who have raised courageous and resistant children. Meeting the needs of the Palestinian people and Palestinian resistance is an important and vital responsibillity which should be carried out by all of us. In doing so, we should not ignore the basic needs of the Resistance in the West Bank because, the West Bank shoulders the main burden of the suppressed intifada. By learning from its past, the Palestinian Resistance should pay attention to this important point: the Resistance and Palestine are too lofty and valuable to get involved in the differences between Islamic and Arab countries, or the domestic, ethnic and denominational differences that exist in different countries. The Palestinians, particulary Resistance groups, should appreciate the value of their preciouspositions and they should avoid entering into these differences. Islamic and Arab countries and all Islamic and national orientations should be at the service of the Palestinian ideal. Supporting the Resistance is the responsibillity of all of us. No one has the right to have special expectations of them in return for assistance. The only condition for assistance is that such assistance is expendeding, strengthening the people of Palestine and the structure of the Resistance. Commitment to the idea of steadfastness in the face of the enemy and to the Resistance in all its dimensions guarantees the continuation of this assistance. Our position on the Resistance is a fundamental position, one which has nothing to do with any particular group. We are with every group that is steadfast on his path and every group that abandons this path has drifted away from us. The depth of our relationship with groups involved in the Islamic Resistance is only dependent on the level of their commitment to the principle of the Resistance. Another point that should be raised is the existance of some differences between various Palestinian group. The existence of differences of opinion is natural and understandable due to the diversity of tastes among these organizations and a long as these differences are confined to this, they will lead to increasing co-operation and depth in the fight of the Palestinian people. However, the problem begins when these differences culminate in skirmishes and – God forbid – serious conflicts. If this happens, these various orientations will practically lead into a path that the common enemy of all them wants. They do so by foiling one another’s powers and capabilities. The managament of disagreements and differences of opinion is a skill that should be utillized by all main orientations. They should formulate their various fighting plans in a way that those plans only pressure the enemy and help the cause to be strengthened. National unity on the basis of a jihadi plan is a national necessity for Palestine. It is expected that all orientations try to achieve this unity in line with the requests of all the people of Palestine. These days, the Resistance is wrestling with another plot as well which is the effort of some so-called friends to divert the Resistance and intifada of the people of Palestine from its course and to sell it to the enemies of the Palestinian nation in their secret transactions wit them. However, the Resistance is so intelligent that it will not fall into this trap. One of the reasons for this is that the people of Palestine are the true leaders of fighting and of the Resistance, and past experiences show that by gaining an accurate understanding of the conditions, they prevent these deviations. God forbid, if one of the Resistance orientations falls into these trap, they (the people) can reproduce that need as they have done so in the past. If a group puts down the flag of Resistance, another group will undoubtedly emerge from the heart of the people of Palestine to hold it up again. Without a doubt, in this conference, you honorable participants will only attend to Palestine which has been subject to lack of proper and necessary attention in the past few years. Undoubtedly, the existing crises in every part of the region and the Islamic Ummah deserve attantion, but what has caused this gathering to be held is the issue of Palestine. This conference can be a model for all Muslim and regional nations to gradually harness their differences by relying on their common points and to prepare the ground by resolving each and every one of those differences, for the increasing re-inforcement of the Muhammadi (God’s greetings be upon him) Ummah. Lastly, I deem it necessary to once more thank you all honorable guests for your valuable presence. Also, I would like to thank the esteemed Speaker of the Islamic Consultative Majlis and his colleagues in the tenth Majlis for the efforts that they made to organize this conference. I as God the Benevolent to help all of you succeed in serving the issue of Palestine as the most important issue in the world of Islam and as the pivot of unity for all Muslims and all liberated individuals in the world. God’s greetings and mercy be upon the lofty souls of all martyrs, particularly upon the honorable martyrs of the Resistance in the face of the Zionist regime, upon all sincere soldiers of the Resistance front and upon the immaculate soul of the founder of the Islamic Republic, who paid the utmost attention to the issue of Palestine. May you be succesful and victorious. Source: Message of the Supreme Leader of the Islamic Revolution Grand Ayatollah Sayyid Ali Khamenei to the Sixth International Conference in Support of the Palestinian Intifada .Tehran, Iran.